Many people have taken a stand against racism in the church and community, but few have done it more courageously and vigorously than the Rev. Louwanda Harris. 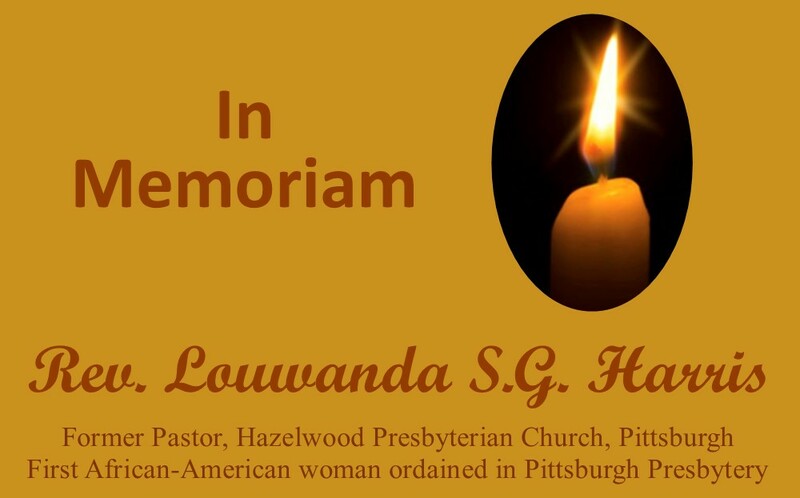 The former pastor of Hazelwood Presbyterian Church in Pittsburgh Presbytery was a social rights icon in the city for many years, and her battle for justice has encouraged countless others to also take a stand. Rev. Harris passed away Tuesday, Jan. 15, 2019. She was 83. Rev. Harris was the first African-American woman to be ordained in the Pittsburgh Presbytery. Rev. Dr. Johnnie Monroe, who himself stood alongside Rev. Harris in a battle against racism, remembers her for her dedication to social righteousness. “I first met Rev. Harris in 1986 when I came to Pittsburgh to work in the areas of evangelism and social witness for Pittsburgh Presbytery,” Johnnie recalled. “She embodied both of these in her ministry. Her ministry and example will be sorely missed in Pittsburgh Presbytery and beyond. “She was a lover of God and a lover of God’s people,” Johnnie concluded. Funeral services for Rev. Harris were held, appropriately enough, on Martin Luther King Jr. Day – Monday, Jan. 21 – at Fountain of Life Church (247 Johnston Ave.) in Pittsburgh. A complete obituary is available here.